Sick of other Grandparents Bragging? Forgive your Self! Home / 2010 / September / 10 / Sick of other Grandparents Bragging? Forgive your Self! September 9, 2010 – Sick of Other Grandparents Bragging? Forgive Yourself! This time of year around Labor day, as school season begins, when I run into my friends with ‘real’ grandchildren, it seems all they do is brag about how well their grownup children are doing and how smart the grandkids are. They complain about the cost of the college, but then they drop less than subtle hints about their 3.5 gpa, or that next year they’ll study abroad. One of my friends that told me their kid read the Sports page of the New York Times at age 7, Stephen King novels in the 5th grade, and spoke three languages by junior high. Whoop-ee-do! 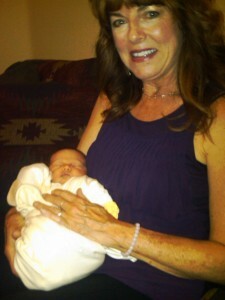 Others send me baby pictures of newborns held by smiling grandmas. I’m happy for them, but do they have any idea how that makes me feel inside? Each time I bite my tongue and hope they don’t want them to ask Larry and I about the four children between us we’ve had a huge part in raising. One is a former heroin addict, struggling to make enough money to buy his monthly prescription for suboxyne, today’s methadone. His sister, Larry’s stepdaughter, also an addict/alcoholic at 32, has had the three babies taken away from her by Child Protective services. Ouch. Larry’s ex has raised her first grandchild in an arrangement with his other grandparents, her then badboy-boyfriend’s parents. That grandson is now 14! Larry’s ex IS really an Invisible Grandparent! My first-born is working in construction in the summer, and as ski patrol in the winter. Not a day in college at 29, as compared to most of my peers, whose kids are college graduates, holding down a $50,000 a year jobs, in a politically correct green industries, because of the great connections they made in graduate school. Sometimes I just want to outlaw bragging. Then I just want to get over it getting to me. Hell no, my firstborn has never seen the inside of a college classroom, though he’s probably been inside a meth lab. I could beam with pride, and do, about my second-born who went to a military academy and at 27 loves his life as a special ops officer in the Middle East. But that kind-of mother pride is filled with the reality of mother-horror any military mom faces when her soldier boy is at war. All four of our kids grew up in loving homes, with moms and dads who sat and read to them, and raised them to know right from wrong, to value honesty and kindness, all that good stuff. At what point do we let go of self-blame, and just know that at a certain age, perhaps any age, our kids’ choices are not our fault? • Remember you did the best you could at the time. • Don’t think you have match stories or lie about the truth. • What is, is. Saying nothing is okay sometimes. • Go find something good and fun that you can do for yourself and do it!